Once in a while we found ourselves short of the glory of God for the transgression we made against the Lord. Most of our sinfulness come from the lack of the fear of the Lord. Our job is to honestly serve others like Christ did. But our thoughts and actions are not far from sin. That is why we need to come before God every day to make our way right with him. We don’t know whether we should go with one idea or the other. When it comes to honoring the name of the Lord, we don’t know exactly what to do. When it comes to choosing whom to please between two individuals that we love, we don’t know what to do. Apparently it might be easier for us to understand when it comes to loving the Lord more than anybody else. Does it mean we can offend the person we love most anyhow? No. But you are the father who gives everything to us, even your own son. Father, yet we don’t understand your true nature. 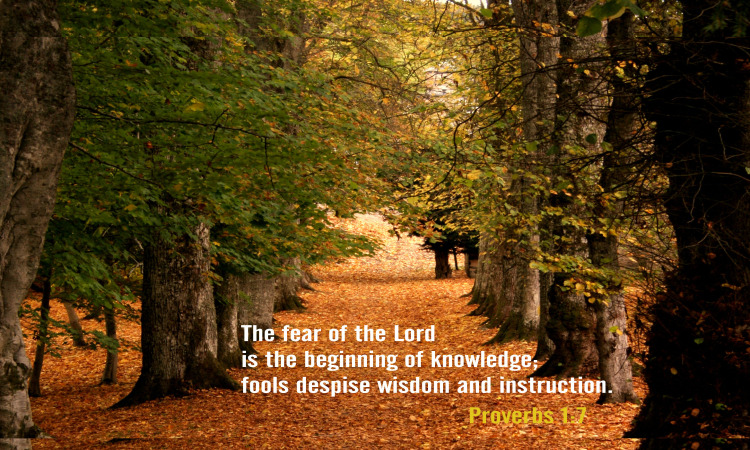 The fear of God is the beginning of wisdom. The fear of God is all the knowledge we need to protect ourselves from any kind of trouble. The love of Christ teaches the fear of God because he lived and taught all about it. Jesus once said, “I will show you whom shall you fear. Fear not those who at most can only kill and destroy your life, but the one who can kill and burn your soul forever.” Even without his will, no one can do harm to you. It is one thing to understand the love of God but another to fear him with reverence and knowing his true nature. I believe as little children of God by faith, it is always easy to love but finding it hard to fear who we love most. But we need to learn and know all we need to know about our father and give him all the honor and praise. As we already know the love and the grace of God through Christ, we also need to know how to fear God and honor him with all of our might, strength and will. What does it mean to honor God? I think it includes to love him first and follow his will no matter what the circumstances are and no matter how we think we feel for ourselves. If we do not make wise decision today and follow the Lord, we will spend the rest of our lives worrying and making miserable decision one after the other. What if we follow our heart which is the Spirit of the Lord deep inside of us? Surely, we will find peace and success in the future. Isn’t it life more important than the rest of the activities? Or most of our worries and miseries are just mere expression to make our lives unhappy. I start to give more time for what really matters in my life. If you dare to ask this question, a question of importance, you will find out that nothing is real than the Lord and his will and purpose for us. Day and night searching for it, we need to spend our entire life on how to learn to make him happy and how to learn to respect him. I learn the latter paying a lot of price. The inclination of our heart toward s disgracing the name of the Lord knowingly or unknowingly will make you pay a great price. God gives a lot of value for his name and glory. May be it is time to learn some of those. Till now you learn how to love him with all your heart. But I guess you know nothing about his glory and power. If you learn to respect him, you will see him in his glory. And he will love and come to you once more again as a wife would always respect her husband and her husband want to make her happy. More than we pay respect to our earthly fathers, we need to do much more to our Lord and savior Jesus Christ. We must think of God in the same way. Give him the proper respect and adoration. If you do not, the rest is accumulating curse and miseries for you and your children. A curse is like a deadly disease in your body. Like a cancer for example. Do you know for every disease in this world, there is a corresponding equivalent curse in the spiritual realm? I mean as God takes his grace and protection. As he takes his spirit, there will come a new kind of spirit that is thirsty and eager to have a place preferably a home to rest and live. This evil spirits don’t come empty handed. They come with what they have in the beginning. They come with curse and anger and hate and more. To physically express themselves, they come with all manner of diseases. That’s why when our Lord tells us, he said our physical problems are directly related to our sins. Our sins are our disobedience and how much we are far from him. For every failure we experience, there is an equivalent disobedient and unwilling to follow instruction from our Lord. “My Lord, I failed to bring the respect and adoration that you deserve due to the stubbornness of my heart and ignorance to your will. Even now I am not what I am yesterday. I don’t have the same feelings as yesterday. You told me and showed me, like a dream, the paths I should take. Guide me how to be a better person than I am now. You are my inspiration and my hope. I wouldn’t do anything without your consent and agreement. We are sometimes unable to identify when we are breaking your laws. My soul is worried from the wickedness of the heart. My soul dreads the terrors of the night. Why you allowed them to make my sleep miserable, my Lord? Please do not forsake me in their hands. Do not abundant you servant when the time is very near. Prayerfully I come to you. With sorrow and sadness I lay out my transgressions. I beg you for your forgiveness. I am not only pray to you to cleanse our soul but also grant us the strength to stand firm in you name. It is very dangerous when temptation comes from our own flesh and our own blood. It is only your word and your Spirit that can help me differentiate the good from the evil. I can no longer distinguish the good from the bad by my own.